It has been published in Australia. Released in Canada and the US on 19th December 2017 (click here for info). In her most comprehensive book yet, the UK’s leading nutritional therapist and bestselling author, Amelia Freer, shares the secrets of her exclusive practice that includes Victoria Beckham and Sam Smith as clients. 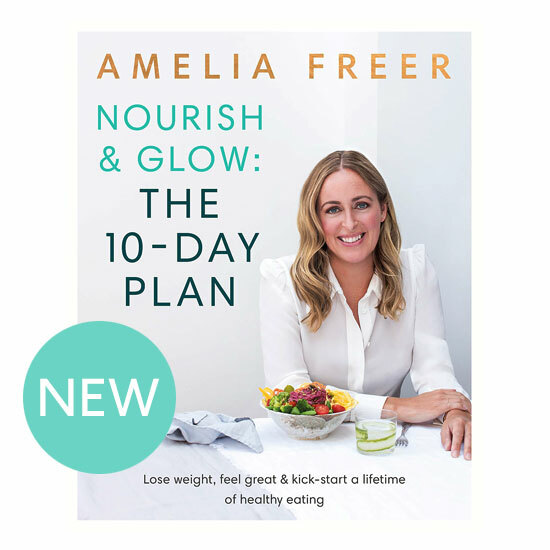 With her engaging and encouraging commentary, including client case studies and scientifically researched guidance, Nourish & Glow: The 10 Day Plan showcases Amelia’s unrivalled easy-to-follow 10 day meal plan and promises to fundamentally transform the way you shop for food, cook and eat: now and forever. Amelia recognises that we are all unique and there is no ‘one-size-fits all’ approach to food. She will empower you to challenge any negative stories or attitudes you might have towards food and transform them into a positive lifelong love affair with eating well. The exclusive 10 day plan included in this book is a version of the plan Amelia gives to her clients, which has been developed and refined over her decade of work as a nutritional therapist. It is NOT about deprivation. It is a liberating, energising plan that will equip you with the building blocks needed to develop and implement a lifetime of balanced eating that is unique to you. Leaving behind all the confusion and negativity surrounding diets and healthy eating, this book helps you find out exactly how and what it means to eat well for you, for the rest of your life. This ultimate guide includes over 50 exclusive gluten, dairy and refined sugar free recipes, complete with vegan and vegetarian alternatives. Together with a unique and exclusively curated tool – Amelia’s Positive Nutrition Pyramid – which will ensure you are unequivocally nourishing yourself with all of the essential ingredients needed for a happy, healthy body and mind.